Like it or not, SEO has become critically important for a lot of businesses. The majority of potential customers for any company will be turning to Google to find a new product or service. It’s become especially massive for e-commerce and local businesses. And according to Hubspot, 61% of marketers report that improving their Search Engine Optimisation and extending their organic search engine presence is their top marketing priority. So even if you’re not concentrating on your SEO, your competitors surely will be. 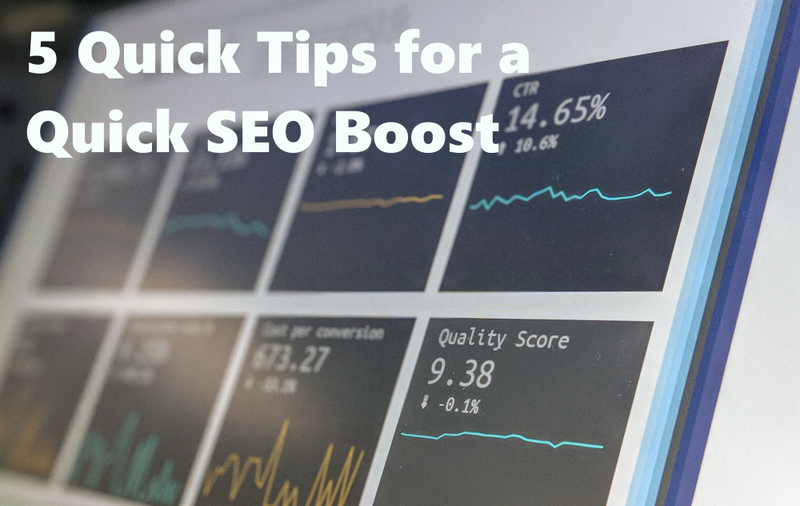 It’s all too easy to get distracted by the day-to-day aspects of running a business and give less attention to your SEO strategy than it deserves. But it should be a big part of any marketing strategy, and even if you have a limited amount of time to give to it, you should definitely be making sure that you’ve got the basics covered. Using Google Search Console (previously Webmaster Tools) and other free gadgets such as Screaming Frog can help you to identify if you’ve got any broken links on your website. The main problem with these broken links is that you’re creating a bad user experience – if you tell someone to visit a page, then that page doesn’t exist, it affects your authority as an information source. Google says that broken links in themselves do not hurt your rankings, but it’s rather that the user experience, therefore your analytics, that are affected and then your ranking is affected. However it’s always wise to take anything Google says with a pinch of salt, as they are constantly changing & updating their ways of working. Either way, it doesn’t look great for any company for their website to be littered with non-existent links. If you can’t pay attention to the detail on your, how are your potential customer supposed to trust you with the details on the services or products that you offer. Authority is a buzzword of the moment in a lot of SEO circles. If your website is an ‘Authority’ (read: reliable source of information, products or services) then it will perform well for your target keywords. But how does a website emanate authority? Well, the first port of call should be knowledge & experience. If you don’t have a clue what you’re talking about, and you’re pretty much just making it up on the spot, just stop. Search Engine robots are clever enough to spot this, and they will penalise you for it. For more on creating great content, see Point 5 below. The second should be Backlinks. Backlinks are links from other websites pointing to your website. The Google crawlers see these links and decide that your site must be a good authority, as there are lots of other people that are pointing to it. Don’t use spammy sites. There’s lots of sites that you can buy links from (relatively cheaply). Don’t be tempted, as Google knows that these sites are not a good source of reliability. Keep it relevant. If Google sees that you’re a florist but you have links from sites about welding, football, or precision engineering, it’s going to know that something’s up and may punish you. Try to stick with relevant sites that are in your industry or local area. Moz has a great tool called Link Explorer that can show you where your competitors are getting their links from. So you can look at a successful competitor and try to copy some ideas of where to build links from. Create shareable content – i.e. infographics, videos, etc. Testimonials – offer testimonials for services or products you’ve purchased, in exchange for a link to your site. By increasing the amount of internal links in your site, you’re making it easier for Google to crawl your website and find the right, relevant content. These internal links also transfer SEO ‘link juice’ to different pages on your website and help to give them a boost in the search engine position in the SERPs. Also, internal links help to improve your website’s user-experience and improves your bounce rate. If you’re not currently using an internal linking strategy, them you’re missing out on an easy quick fix for SEO. Go through your website and find opportunities to create internal links within different pages on the site. You can also find out which are your best-performing pages and make sure that you have good links pointing out from these. As a last point, remember to diversify the anchor text that you’re using to make those internal links. Use important keywords as the anchor text for internal links (but don’t overdo them). Site loading speed has become incredibly important recently. As Google looks to improve the user experience for its searchers, it doesn’t want to direct people to websites that take forever to load. If your website is slow, you will be penalised. You can check your site speed by using tools such as Google’s PageSpeed Insights or Pingdom. Whichever way you do it, your site will benefit massively from a smaller loading time. You will see your bounce rate improve and your mobile ranking increase. Great content is still one of the most important cornerstones of SEO. Google has to know that your website is regularly updated, with interesting & relevant content, before it will give you a decent chance in the rankings. Write for humans, too. The days of stuffing a blog post with as many keywords as possible are long gone. Crawlers can recognise when your content is well-written and will reward you accordingly. And don’t duplicate content! This is a big no-no, as Google will pick up on this and will penalise you for stealing other’s content. Hubspot offer some great ideas for starting a blog that can be carried into your website’s blog section. The main thing to remember when writing your blog posts is to know your audience and answer a question. So hopefully some of these have been helpful for you! Let us know below. Sharpmonkeys is a Digital Marketing Agency that offers SEO, PPC & Web Design.